In recent weeks, President Obama has been on the road citing the need for programs that bolster the middle-class. But having weathered a recession that staggered the economy, a 2012 survey shows Americans have changed their views on what it takes to be part of the middle-class. Nearly nine-in-ten adults (86%) say a person needs a secure job to be considered part of the middle class, while just 45% say the same about owning a home, 37% about a college education and 28% about financial investments. Of the five items tested in the survey question, the only other one seen as essential to a middle-class lifestyle by a majority of the public is health insurance—which many Americans receive through their work. 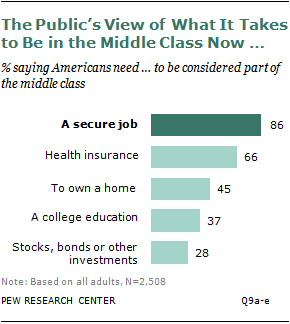 Two-thirds of adults say it’s an essential requirement of a middle-class lifestyle. 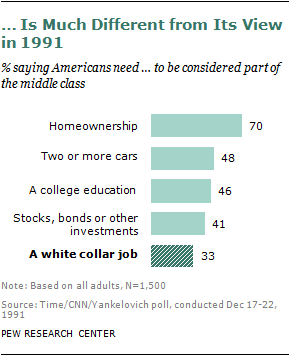 Some of the sharp differences between the public’s responses in 2012 and 1991 are likely the result of wording differences between the two surveys: “a white collar job” (the wording used in the 1991 survey) is arguably a narrower and less compelling choice than “a secure job.” But some of the variance may also reflect the persistently high unemployment rates of the past few years as well as a longer-term decline in the share of the working-age public that is employed.